Actor Ahmed El Sakka’s son، Yasein posted on his official “Facebook” account a new picture of himself with his family. The picture showed Yasein، accompanied by El Sakka and his mother، TV presenter Maha Al Sagheer and his siblings. This is considered to be all of El Sakka’s children first-ever media appearance. Syrian actress، Kinda Alloush accepted UNHCR five kilometers walk challenge "Khatwa Kheir” to show solidarity with refugees after Mustafa Agha challenged her, and others, on his official “Twitter” account. The Syrian actress had tweeted on Twitter her acceptance saying: "For your eyes and God willing it will do it on Saturday، God willing.. And of course when Mustafa Aga challenges then the challenges have to be athletic." Superstar، Sherine Abdel-Wahab is set to release today، Friday a new music video from her album “Nassay”، on her official YouTube channel. Sherine took to her official “Instagram” account to announce the news، where she posted a picture from the music video، which features herself and her husband، singer Hossam Habib. “I will release a new music video from album #Nassay، what do you think it will be?” she captioned. The music video will be released at 06:00 PM (Cairo local time). Lebanese recording artist، Elissa congratulated on her official “Twitter” account، Lebanese politician Prime Minister Saad Hariri on the formation of a new government. "Congratulations to the new government we are waiting a lot and now the time has come for actual work from all the people، good luck to the prime minister and all the ministers." Egyptian actress، Ola Roshdy delivered on her official “Instagram” account a romantic message to her husband، Ahmed Dawood celebrating his 36th birthday، which falls on January 30. Multi-talented star، Mohamed Ramadan announced on his official “Instagram” account that his latest music video “Mafia” earned 51 million viewers in 30 days. Ramadan also revealed that he is preparing to release a new music video he within days. Lebanese superstar، Nawal El Zoghbi and Iraqi superstar، Majid Al Muhandis will perform at Sharjah's popular waterfront venue Al Majaz Amphitheatre، in UAE، on March 1st، amid a large attendee of families and youth. She posted a poster of the upcoming poster، and captioned: “Can’t wait to see you all in Alsharga on March 1”. Al Majaz Amphitheatre is dedicated to present all kinds of performance art، hosting theatrical performances، musicals and concerts، according to Al Majaz Amphitheatre theatre website. The events are either produced and organised by Al Majaz Amphitheatre or hosted as visiting events. Jordanian star، Saba Mubarak posted her latest photos of herself via her “Instagram” account. Saba appeared in a casual look، with simple makeup and hairstyle، which gained the admiration of her fans across the social network. Meghan Markle's acting career began long before she starred on Suits! Katharine McPhee took to Instagram on Thursday to share the most epic throwback photo with none other than the Duchess of Sussex from the play they performed in their adolescent years. The two are just a couple of theater kids in the pic، smiling wide in their costumes and bright red lipstick. "Meghan and I did musicals together as kids. She grew up to be the Duchess of Sussex and I grew up to star on the West End، so same life if you ask me. #TBT،" McPhee captioned the snap. Both McPhee and Markle were born and raised in Los Angeles، but had different routes to stardom. Markle scored a small part on General Hospital in 2002، and worked in TV before nabbing a lead role on Suits in 2011. McPhee، meanwhile، became a household name in 2006، after she was the runner-up on season five of American Idol. She later transitioned into acting roles، and maintains successful acting and singing careers today. Beyonce wants you to go vegan -- and she's willing to give you free concert tickets for life if you do it. The "Best Thing I Never Had" singer revealed on Instagram on Wednesday that she and her husband، JAY-Z، are giving away free tickets to their shows for the next 30 years for one lucky fan who commits to a plant-based lifestyle. Bey، who has been a proud vegan for years، is hoping to educate the public on the environmental benefits to going meat-free. Through her and her husband's 22 Days Nutrition company and Greenprint Project، the couple offers up tips and tricks to embracing the vegan lifestyle. Those who pledge to introduce plant-based meals to their diet on the Greenprint website will be entered to win two free tickets to every single Beyoncé andor JAY-Z concert for the next three decades. The winner will be chosen at random on May 22. No one knows how to throw a rager like Jessica Biel! The 36-year-old actress took her husband، Justin Timberlake، out for his birthday a day early in New York City، but the actress seemingly struggled to stay awake for the festivities. “Gotta work tomorrow for my bday so wifey really going all out tonight…” Timberlake captioned a funny video on his Instagram page. In the clip، Timberlake quietly sings، “Happy Birthday to me،” in the back seat of a car، panning to a sleeping Biel. Timberlake turned 38 on Thursday، but has a show on his Man of the Woods tour at Madison Square Garden in the evening. 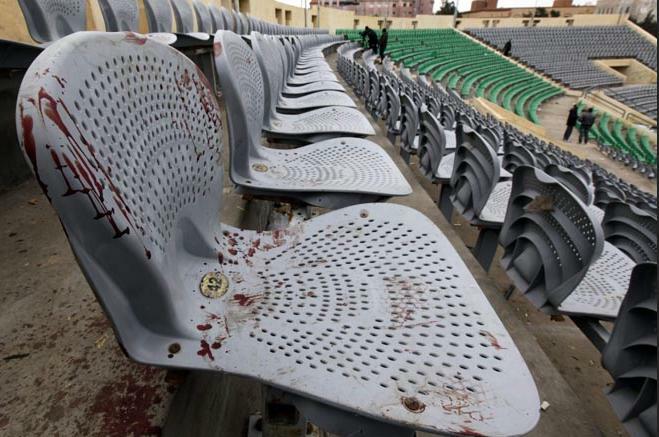 Al Ahly SC official “Twitter” account posted a number of pictures of the club’s board of directors marked on Friday the seventh death anniversary of the deadly 2012 Port Said Stadium riot. “The Board of Directors of Al-Ahli Club commemorated this morning the seventh death anniversary of the 72 martyrs of the finest young people of the public، and emphasized that Al Ahly will not forget his martyrs and that their memory will always be engraved in its hearts and minds of the club and its officials.” The account tweeted. On 1 February 2012، a massive riot occurred at Port Said Stadium in Port Said، Egypt، following an Egyptian Premier League football match between Al-Masry and Al-Ahly، leaving 72 martyrs of Al Ahly fan killed، and more than dozen injured. Twitter users launched #RIP_AlAhly_Victims، where they flooded the platform with offers of their condolences and confirmed that Victims were always in the heart.